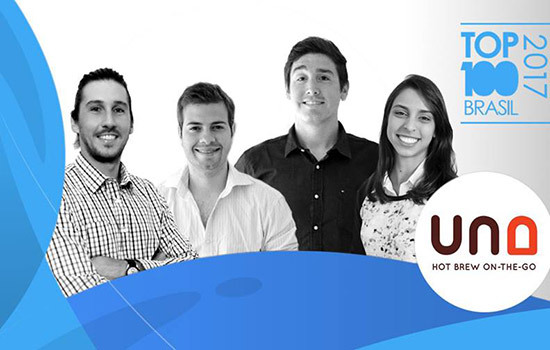 UNA Smart, a coffee and tea brewing company founded in 2015 by RIT graduates, was named to Brazil’s Top 100 startups list by 100 Open Startups and Wenovate-Open Innovation Center. Pictured, from left to right, are Marcelo Sala, Guilherme Andrade, Mauricio Reck and Lara Goulart. 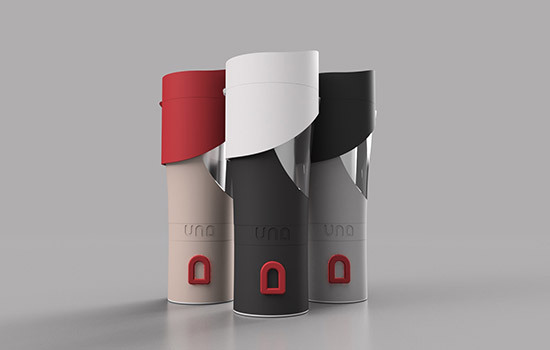 UNA Smart, touted by developers as an innovative way to brew coffee and tea anywhere and anytime and created by five Rochester Institute of Technology alumni, was recently named to Brazil’s Top 100 startups list by 100 Open Startups and Wenovate-Open Innovation Center. UNA Smart cracked the top 100 among the 2,800 startups considered and ranked fourth in its category, reportedly making it one of the best companies to invest in 2017. RIT graduates Mauricio Reck ’16 (manufacturing and mechanical systems integration, MS), Guilherme Andrade ’15 (mechanical engineering, MS), Lara Goulart ’16 (industrial design, MS), Bruno Scarpin ’16 (manufacturing and mechanical systems integration) and Thiago Lima ’16 (electrical engineering), all of Brazil, created the UNA Smart device in 2015. Marcelo Sala has since joined the UNA development team. UNA Smart users fill the device with water, insert a biodegradable coffee pod and click a button either on the coffee maker or on the mobile app to begin brewing. The mobile app also allows users to set timers for their coffee brewing, track daily consumption and caffeine intake, and reorder UNA coffee pods automatically when the system identifies that they are running low on coffee. Users can also customize their coffee using different temperature curves to refine their brewing process for better extraction, strength and acidity, and can create a configuration for their coffee and share it with friend, all using the mobile app. In 2014 and 2015, UNA Smart was a semi-finalist in the New York State Business Plan Competition and was selected to participate in the Saunders Summer Startup Program in 2015. The Saunders Summer Startup program and mentoring network is RIT’s most intensive full-time entrepreneurial program. It is a partnership between the Albert J. Simone Center for Student Innovation and Entrepreneurship and the Saunders College of Business. Richard DeMartino is the center director and a professor in the Saunders College of Business. The team is now developing a third working prototype and looking for investments. They hope to bring their product back to the United States. Wolcott, lead innovation coach at the Simone Center, worked closely with the team while they studied at RIT, and still mentors them as they develop UNA Smart in Brazil. UNA Smart is touted by developers as an innovative way to brew coffee and tea anywhere and anytime.